When Will We Resurrect Yuka The Woolly Mammoth? 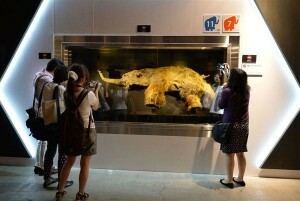 THE BEST-PRESERVED WOOLLY MAMMOTH GOES ON DISPLAY IN JAPAN, BUT SHOULD WE RESURRECT IT? “A prehistoric woolly mammoth that was long encased in the New Siberian Islands has gone on display in Yokohama, Japan, so visitors can see for themselves what is considered the best-preserved mammoth ever discovered. More more on species resurrection see the Revive & Restore project. They are presenting working on bringing back extinct species. They’ve already starting with the passenger pigeon. Emily K. Editor on 29 Jul 2013 | Ancient Wonders &Mysterious History &Near Death & Reincarnation &Oddities &Science & Research &Uncategorized | Comments Off on When Will We Resurrect Yuka The Woolly Mammoth? Are Blackholes Causing The Breakdown of Physics? Is the fact that our theories contradict each other proof that there is a god, or that science is wrong? What do you think? Emily K. Editor on 26 Jul 2013 | Ancient Wonders &Audio & Video &Oddities &Psychology & The Mind &Religion & Spirituality &Science & Research &Uncategorized | Comments Off on Are Blackholes Causing The Breakdown of Physics? Unlooted Royal Tomb Unearthed in Peru! For the complete article click here to go to National Geographic. Emily K. Editor on 22 Jul 2013 | Ancient Wonders &Mysterious History &Mysterious News &Near Death & Reincarnation &Religion & Spirituality &Science & Research &Uncategorized | Comments Off on Unlooted Royal Tomb Unearthed in Peru!